Food, bread, is what gives us nourishment. 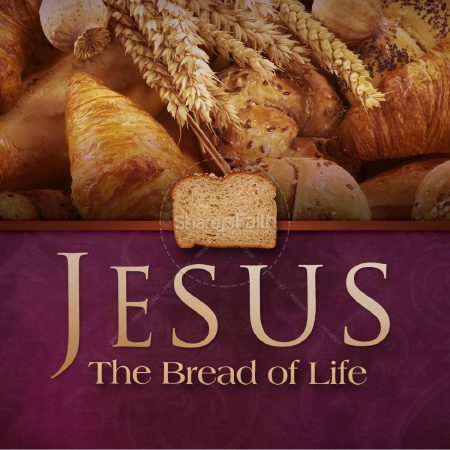 And Jesus desires to nourish our souls just as bread nourishes the body. We have to partake of him, of his very body and blood. This text is kind of icky—and if it’s uncomfortably close to cannibalism for us, just think of the first people who heard it! What did Jesus mean when he said we had to eat his bread and drink his blood? Two things: conversion and communion. We’ve been talking about the conversion Jesus is seeking, for us to have changed hearts because of his presence in our lives. In this sense, Jesus wants us to consume his teachings, his Spirit, his influence by drawing closer to him. Brian Peterson writes, that in this passage, Jesus switches to a less common word, trogo, that has a connotation closer to “munch” or “gnaw.” We are called literally to chew on Christ, to gnaw on his words, to gobble up his example, to learn to live by feeding on his Spirit in our lives. We are what we eat, and we are called to eat up Christ. I had a friend over recently, and she saw my devotional, Getting to Know Jesus, on the steps, and she said, “Oh, is that any good?” The funny thing is, as soon as she came over, and I looked at my living room through her eyes, I knew she’d ask about it. Not from any self-righteousness, but just because she is simply a person in love with Jesus, and when she saw the word “Jesus,” the promise of getting to know him better, she would say, yes, yes. Is this who people would say you are—someone hungry for Jesus? Turn your hunger over to Jesus. He is the only one who can satisfy it. The other meaning of eating Jesus’s bread and drinking his blood is communion. Christ commands us to celebrate this sacrament because in this feast, there is something holy and amazing happening; we are spiritually fed by Christ. Today, we will observe communion by intinction, as the Session has authorized for the summer months. While many people like the pew communion, and the experience of eating and drinking all as one community, at the same exact moment in this church, others have a deep and spiritual experience of being fed individually by a brother or sister in Christ. Jesus says that to eat his flesh and drink his blood means having life now. 53 So Jesus said to them, “Very truly, I tell you, unless you eat the flesh of the Son of Man and drink his blood, you have no life in you. 57 Just as the living Father sent me, and I live because of the Father, so whoever eats me will live because of me. There’s a show, The Walking Dead? About zombies. We’ve all heard of zombies—creatures who stumble around, hungry for flesh. I think most people are like zombies, walking around without considering anything beyond the flesh. They don’t consider the eternal nature of their own souls, or the souls of others. You and I are called to be different. We are called to be fully alive, right now. To keep our minds on the constant and eternal questions. Not to sleepwalk through life, but to be fully present within the moment. For my flesh is real foud, and my blood real drink. All meals point to the true communion we are promised in Jesus. Receive him and have life now. Why do we have life? Because the author of all life lives within us. 56 Those who eat my flesh and drink my blood abide in me, and I in them. If you are participating in communion, you should be becoming, more and more, the kind of person who shows others who Christ is. Think about your words, your actions, this past week: did they demonstrate who Christ is? How did your thoughts, words, and deeds reflect a changed life? Finally, Jesus promises us that when we eat his flesh and drink his blood, we will live forever. Since heaven is not a place we can see, it’s natural to doubt its existence. But think of this: a miracle brought us into this world. Doesn’t it stand to reason that a miracle could bring us out? I remember sitting with a woman who was near death, and she shared her fears to me: she felt like she was in a dark tunnel, and she couldn’t see a way out. I shared with her that sometimes I think about what the moment of birth was like for my daughter. It must have been terrifying to be trapped in a dark place with no way out. But she had no idea that on the other side were so many people waiting to welcome her, and a world bigger than anything she had ever dreamed. I think this is how it is with heaven. We can’t see it yet, but there’s a whole world waiting for us, people ready to embrace us, and more beauty than we’ve ever imagined. If you take Christ within you, you join in his death and in the miracle of his resurrection. You are united with him in the risen life, and he will carry you with him into the life beyond life. Take hold of Christ. Take him into your body, heart, and mind. Let communion be your conversion and you will live, fully and forever. The Bread of Life is yours.